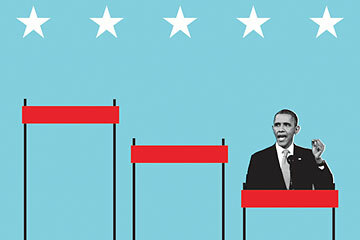 Barack Obama, liberated from the thrall of electoral politics, has now given us two major speeches to set the style and substance of his second term. Both were powerful; both had moments of high passion, a quality the President kept in mothballs for most of his first term. But neither was daring; neither pointed a way past the rutted politics of the moment. They assumed the status quo. They paved the way to past arguments. Every State of the Union has a laundry list of proposals. Obama's mostly pushed familiar moderate-liberal buttons. The one exception was in education. The President redressed a long-standing imbalance by emphasizing practical education in addition to academic achievement. His proposed high school reform would no longer push every student toward a four-year bachelor's degree. It would add a system comparable to the one that has served Germany so well, wherein schools and businesses partner to create jobs for skilled workers. The rest was not much. The President added little that was new or meaningful about job creation. He had nothing to say about how to make health care better, not simply less expensive. He proposed soaking the rich to pay for Medicare, which isn't a bad thing; it's just entirely inadequate for creating a humane information-age health care system. He did not put economic growth and deficit reduction in proper perspective: growth is far more important than deficits in the short term; deficits are a long-term problem that we can start to address now with more-effective programs rather than just a chopping block. His views of spending and budgeting were depressingly conventional. All his programs would be "paid for," a perfunctory yet totally unconvincing expression of prudence. Why should they be? Why shouldn't government view capital investments--in education and infrastructure, as opposed to entitlements--as a necessary requirement for long-term growth, like private enterprise does? Why not separate capital investments from operating budgets, as most cities and states do? Better still, why not start a major conversation about the creaking, anachronistic bureaucracies that dominate government now? For example: the dreadful Department of Veterans Affairs. Should veterans in the 21st century enter the system by filling out forms that, all too often, get lost, or molder in piles, or are sent to dreary, careless case workers--or should they customize their services through a smart phone, a device far more user-friendly to the generation coming home than incomprehensible paper? (There is at least one such app on the horizon.) Same for the government job-training bureaucracy: Why not another app, one that lists the programs available to unemployed workers and their success rates? Why is this President locked into a model of government that is as current as a rotary-dial phone?